This morning I had this crazy dream and I woke up unsure of where I was. I saw my reading nook and thought, well at least they brought my bedroom decor to this new place. I guess being away from home for almost two weeks really threw me off. We just got back from an amazing vacation, actually a vacation within a vacation. We began in Utah with our annual Utah cousin trip (except this year due to a move and our timing we were missing a family), then after a few days at that vacation went to Yellowstone for my family reunion. It was an amazing time and I am now pouring through my thousands (okay literally about 1,000) pictures from the trip and trying to sink back into reality. 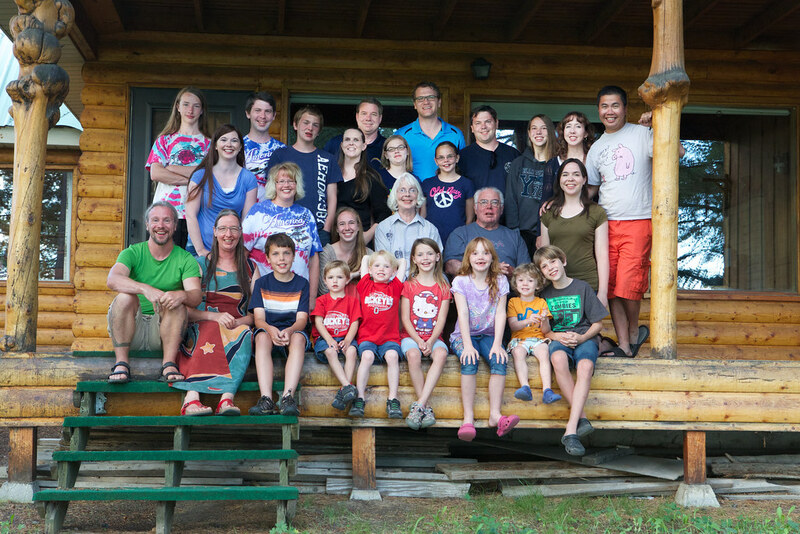 So today I will leave you with a family picture that became even more special as we were able to take it on the porch of my grandparents cabin that we went to as children that my Dad helped build. We no longer own this cabin and the new owners were nice enough to let us come invade their space for a bit. How do you recover from vacations? Can't wait to hear about this amazing time! Oh goodness, big family! Sounds like it was a fabulous trip!! I do love the fact that your mom and dad were able to bring the whole family together. So sweet! Yes, it really was so much fun and a great time, it has been such a long time since we were all together.